How accurate is this portrayal of social welfare linkages between individuals and the government in the Islamic Republic? In late 2016, my colleague and I produced the Iran Social Survey, a nationally representative survey fielded via landline phone to 5005 randomly selected respondents throughout the country. Our main goal was to empirically assess prevailing accounts of social and political dynamics in Iran. One of the most comprehensive survey segments measures household linkages to social welfare services. To gauge the degree and range of state-society linkages through social welfare policy, we asked respondents whether “anyone in their household receives insurance, aid, or income” from a list of public, semi-public, and private organizations. Included in the list were several post-revolutionary bonyads. – Imam Khomeini Relief Committee (IKRC): Founded in 1979, this is the largest self-identified revolutionary welfare institution in Iran. Funded through government sources, income-generating investments, as well as private donations, benefits include monthly income transfers, in-kind aid, and subsidies for health care costs. By population reach, this is the biggest bonyad in Iran. – Social Security Organization (SSO): Founded before the 1979 revolution by the Pahlavi monarchy (1925-79), the SSO provides social insurance for formal employees in large firms in the public and private sector. Since the late 1990s, enrollment among employees in small firms and informal self-employed has been encouraged. Social insurance includes health, pension, and disability benefits. The SSO is administered under the Ministry of Cooperatives, Labor, and Social Welfare. – Civil Service Pension Fund (CSPF): One of the oldest social welfare institutions of the Pahlavi monarchy, the CSPF continues to provide social insurance for government employees. It is currently managed by the Ministry of Cooperatives, Labor, and Social Welfare, and does not cover employees in the military, law enforcement, or Islamic Revolutionary Guards, each of which has their own social insurance organization. – Yaraneh/cash transfer: Enacted in 2011 by the Ahmadinejad administration as a partial replacement for liberalization of price subsidies on fuel and electricity, this is a direct cash transfer to a specified bank or credit institution account held by eligible individuals under a given income line. After 2013, the Rouhani administration continued the yaraneh/cash transfer program, although the real amount has declined due to inflation. Overall, most households reported the receipt of unconditional cash transfers in Iran, a relatively new policy innovation, amounting to roughly $11-12 USD/month per person. It should be noted that 85 percent of survey respondents fall into the lowest three income categories in Figure 1, with 23.4 percent of respondents self-reporting household incomes under 500,000 tomans (approximately $130 USD) a month. As the figure shows, nearly all of the respondents in the poorest household category (N=1169) reported receiving cash transfers. 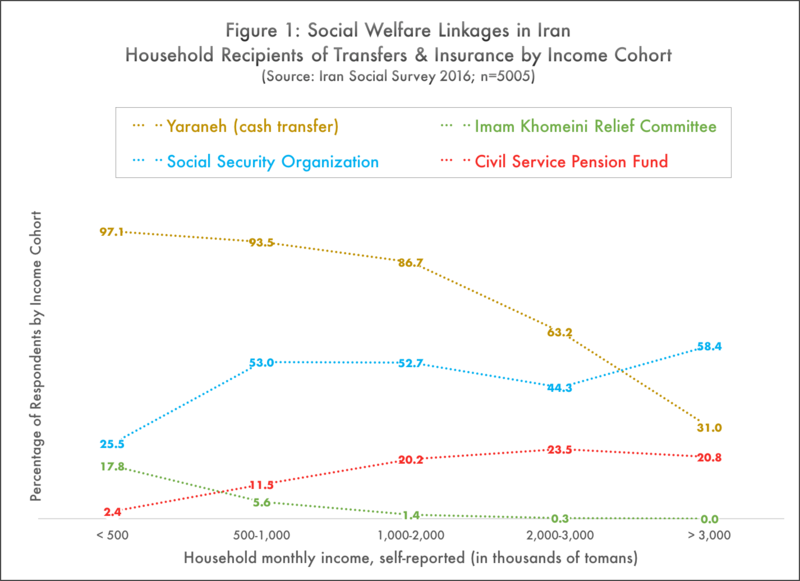 Moreover, within this poorest income category, more respondent households are linked to the Social Security Organization than the Imam Khomeini Relief Committee. In other words, among poorer Iranians, more beneficiaries are linked to the main governmental social insurance organization than the largest semi-governmental bonyad. This might be a surprising finding for Middle East analysts, given popular accounts of semi-governmental bonyads as the key Iranian institutions of aid and insurance for low-income households. Yet the limited reach of the IKRC can be seen in claims by the organization itself. In 2008, only three years into the Ahmadinejad administration and well before the implementation of cash transfers, the IKRC reported that 1.9 million households (around 10 percent of total households) were covered by its services. The SSO, on the other hand, covered more than 40 percent of the population in 2008, and continued to expand coverage over the next decade. There is no one insurance fund that pools the health costs in Iran. For instance, with a population of 75 million, there are almost 85, or some figures say, 90 million insurance booklets, which means that there are some people with two or even three insurance schemes, which is absolutely a waste of resources. If your dad is a public servant, you are entitled to insurance from the [CSPF]; if your mom is a factory laborer, you are also entitled to insurance from the SSO; if your brother is in the military, you can have insurance from the Armed Forces Insurance; and if your sister works in the mayor’s office, you are entitled to a type of private insurance for some special services. This is the story, more or less, across the country. Contrary to popular accounts of social welfare in Iran as a vehicle to specifically target poor citizens, the main linkages to Iran’s social welfare system, as with most middle-income countries, are clustered among households in the middle and upper-income strata of the population. Amidst the poorest stratum of survey respondents, this sort of cross-organizational linkage is less apparent: only 2 percent of survey respondents reported linkages to both the IKRC and the SSO. Among middle and upper income strata, the reach of the SSO expands while linkages to the IKRC are absent. This is to be expected, as the IKRC uses means-testing to deliver aid to low-income households. The reach of the SSO to lower income strata is consistent with the expansion of benefits to a range of occupations in the informal, self-employed sector of Iran’s economy over the past decade, where poorer Iranians tend to earn a living. In reality, however, it is higher-income households which are more likely to be linked to pensions and health insurance across multiple organizations: 14 percent of respondents in the survey reported that their household was linked to both the SSO and the CSPF. With regards to other well-known bonyads in Iran also purported to be organizations of mass patronage and party mobilization, we asked respondents about these as well. In the case of Bonyad Mostazafan (Foundation for the Dispossessed), only 36 respondents out of 5005 (0.7 percent) reported a household linkage. In the case of the Bonyad Shahid (Martyrs Foundation), only 95 respondents (1.9 percent) reported a household linkage. These shares are also consistent with the counts of beneficiaries officially reported by these organizations. Moreover, even if there is underreporting in the survey for smaller bonyad organizations due to perceived stigma (though this is arguably not the case for cash transfers, a policy equally associated with conservative Iranian politicians), this underreporting would have to be extremely widespread to raise the importance of these bonyads to the level of linkages from other social welfare organizations. 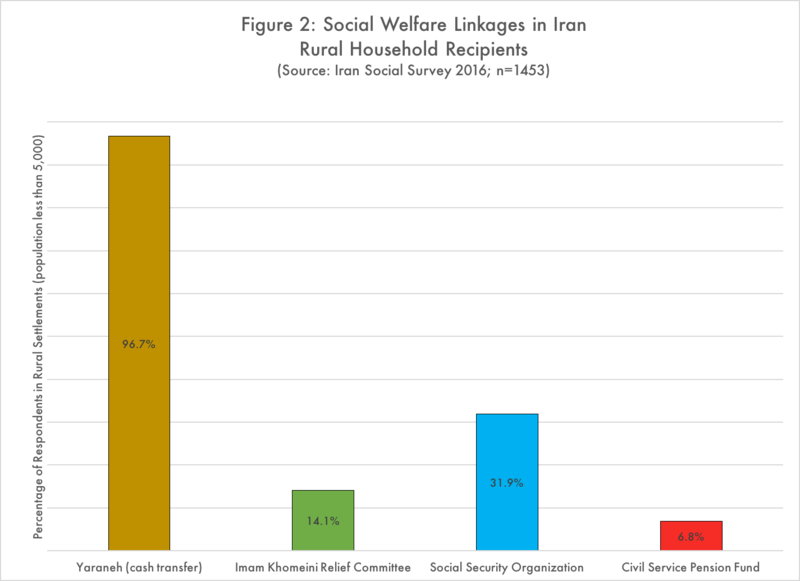 On the whole, the survey data illustrates the reach of core welfare organizations under the control of the central Iranian government, not semi-governmental bonyads, into the poorer strata of society. What about rural households? It is regularly stated by journalists and scholars that the political base of the Iranian regime is strongest among rural citizens, who tend to be poorer and less educated than urban residents. In Figure 2, household linkages to the above social welfare organizations are displayed among only rural respondents (living in a settlement size under 5,000 people). As shown in Figure 2, even rural households are more likely to be connected to the government-run SSO than the bonyad IKRC. Overlap among rural household linkages to both organizations is minimal (3.2 percent). In addition, nearly all rural households receive a bimonthly cash transfer. The yaraneh/cash transfer program is often construed as a naked “handout” of cash in exchange for votes in Iran. Given the basic design of the policy, this is a misleading characterization. While the recipients of cash transfers might perceive particular politicians or factions more favorably due to the implementation and advocacy of this program, the distributional structure of a universal cash grant does not resemble a patron-client relationship. Every household receives one cash transfer per individual, regardless of occupation or voting behavior. Given the mix of cash transfers, health subsidies, and social insurance reported in the survey, a narrowly targeted clientelist machine does not seem to be prevalent in rural Iran. Rather, rural household linkages to social welfare organizations resemble those under a modern welfare state with programmatic policies at its center. Do state linkages displace associational activities? Civil society, defined as non-state and non-family associational activities, is a concept often invoked in scholarship on Iran and the broader Middle East, usually by declaring the absence of associational activities. Some reports of Iran portray everyday life as routinely captured by state penetration, displacing the associational arenas where public social interaction could take place. This assertion has rarely been empirically assessed outside of anecdotal or official accounts. To gauge the degree of participation in a variety of non-state associational activities, the Iran Social Survey asked respondents whether they currently participate or used to participate in a range of formal or informal groups, clubs, or other associations. The most commonly reported association participated in by respondents was the neighborhood religious association (hey’at-e mazhabi). These organizations often arrange holiday celebrations in Iran, endorse candidates for local offices, and sponsor commemorations of notable individuals. They are commonly funded by private means from local residents and do not require the participation of state-appointed clerics. Four decades ago, during the buildup to the 1979 Iranian revolution, the neighborhood religious association was arguably a more important institution than the local mosque for organizing collective behavior, sharing political information, and mobilizing individuals towards action. Little research has been conducted on the role of neighborhood associations in contemporary Iran. With the inclusion of this type of association in the Iran Social Survey, we can estimate participation and examine variation between different groupings of respondents. 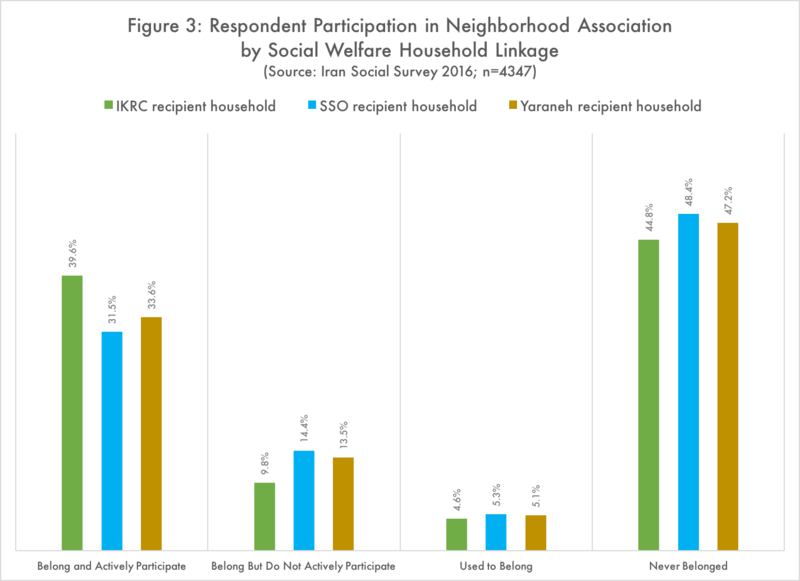 In Figure 3, self-reported participation in a neighborhood religious association is compared across respondent households linked to three types of social welfare: the IKRC, the SSO, and cash transfers. There is no significant difference in neighborhood religious associational participation across the types of social welfare linkages. For the most common type of non-state, non-family associational activity in Iran, then, state-welfare linkages are not associated with lower rates of participation in civil society. Do beneficiaries of different welfare organizations in Iran, bonyad or governmental, vote differently? If bonyads were consequential vehicles for turning out the vote for conservative politicians in Iran, this might be observed in the reported vote choice by individuals who live in households linked to the Imam Khomeini Relief Committee. After all, to become eligible for IKRC aid, a household usually has to receive a visit from a local IKRC officer in order to take a means test or have their home examined. This would be a prime site for clientelist mobilization to occur, especially if the IKRC made benefits contingent on vote choice. We asked respondents to recall their vote choice, if any, for president in 2013. As a competitive race between the moderate candidate Hassan Rouhani and four conservative politicians, the vote choice of respondents might tell us about how welfare linkages affect political inclinations in a mobilized election with wide turnout. 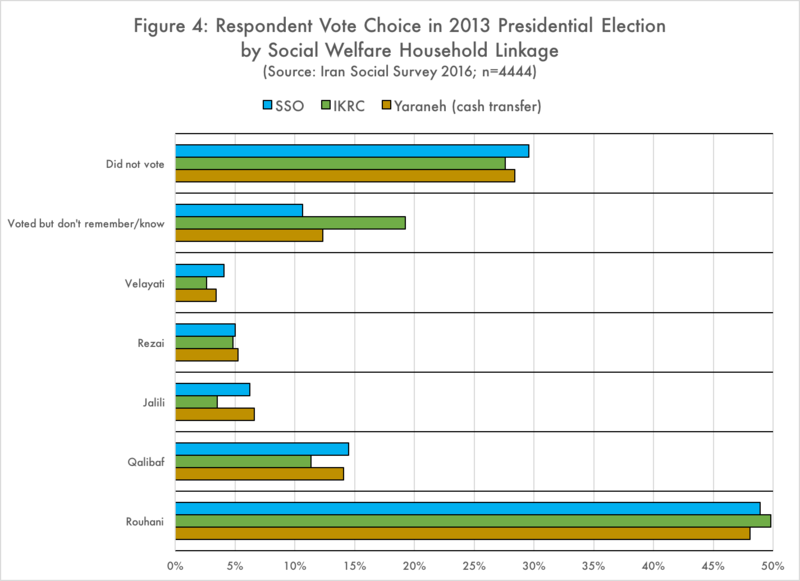 However, as shown below in Figure 4, among all vote choices for the 2013 presidential election, including the choice not to vote at all, there is no significant difference among respondents linked to different welfare organizations. The higher share of respondents in IKRC-linked households who reported that they did not remember for whom they voted (19 percent) is likely due to the fact that poorer voters in general reported in higher numbers that they did not remember (17 percent). These data suggest an important finding about electoral mobilization in Iran. Individuals linked to welfare programs currently or formerly associated with conservative politicians or factions (the IKRC with post-revolutionary conservatives; cash transfers with the Ahmadinejad administration) are not voting differently on average than people linked to welfare programs associated with technocratic or moderate politicians or factions (SSO). Given that individuals’ linkages to the largest Iranian social welfare organizations, including the largest bonyad in the IKRC, do not seem to correlate with associational and electoral behavior, it is worth asking: Is the model of a clientelist-welfare machine operational across the Islamic Republic of Iran? If such a model was on display during the chaotic and violent post-revolutionary period after 1979, it has been subsumed and surpassed by a much different system of social welfare distribution. Even with numerous forms of electoral competition, high levels of intra-elite strife, and a marked degree of ideological friction, the clientelist model of welfare-based mobilization is not discernable in Iran at a systematic level. In a recent book, I have offered an alternative theory and account of the origins and development of social welfare organizations in Iran. Given the new findings from the Iran Social Survey, it is perhaps time to reassess which models of politics and state-society relations are observable in Iran for other spheres as well. Manochehr Dorraj and Michael Dodson, “Neo-Populism in Comparative Perspective: Iran and Venezuela,” Comparative Studies of South Asia, Africa and the Middle East 29, no. 1 (2009): 145. See similar remarks in Kenneth Katzman, “Iran’s Bonyads: Economic Strengths and Weaknesses,” Memo for Emirates Center for Strategic Studies and Research, 6 August 2006. Kevan Harris and Daniel Tavana, Iran Social Survey (2016). The sample was stratified by all 31 Iranian provinces and then by settlement size, with distributions based on the 2011 census. According to the Statistical Center of Iran, 99 percent of urban households and 90 percent of rural households have a fixed telephone line. Calls were made from inside Iran. The ISS contact rate was 75 percent and the response rate was 64 percent. See Kevan Harris, “The Politics of Welfare After Revolution and War: The Imam Khomeini Relief Committee in the Islamic Republic of Iran,” in The Cup, the Gun and the Crescent: Social Welfare and Civil Unrest in Muslim Societies, edited by Sara Crabtree, Jonathan Parker, and Azlinda Azman (London: Whiting and Birch, 2012), 134–50. 1387  Statistical Report [in Persian], Imam Khomeini Relief Committee (Tehran: IKRC, 2008), 21. The Social Security Organization from a Statistical View, 1340-90 [in Persian] (Tehran: SSO, 2015), 9. Quoted in Kevan Harris, A Social Revolution: Politics and the Welfare State in Iran (Oakland: University of California Press, 2017), 169. See, for example, Saeid Golkar, Captive Society: The Basij Militia and Social Control in Iran (New York: Woodrow Wilson/Columbia University Press, 2015), which contains useful accounts of organizational membership but assumes that state linkages and civil society activities are mutually exclusive. These included trade and professional associations, mosque organizations, sports and cultural groups, charitable societies, and the basij organization. See the evidence marshalled against the notion of a coherent “mosque-bazaar alliance” in the mobilizational upsurge of the 1978-79 revolution in Charles Kurzman, The Unthinkable Revolution in Iran (Harvard University Press, 2005). Alternatively, over 12,000 neighborhood religious associations were estimated to exist in Tehran alone during the 1970s, often connected to trades, villages of origin, or religious shrines. See Mohammad Baqir Najafi, “A Short Study of Media, Centers and Religious Organizations” [in Persian], appendix in The Role of the Media in Supporting Cultural Development, edited by Ali Asadi and Hormoz Mehrdad (Tehran: Iran Communications and Development Institute, 1976). See pp. 14-15 and 217-225 in Kevan Harris, A Social Revolution: Politics and the Welfare State in Iran (Oakland: University of California Press, 2017).